RLCS, Revista Latina de Comunicación Social, 73 – Pages 37 to 54 [Research] [Funded] | DOI:10.4185/RLCS-2018-1244en| ISSN 1138-5820 | Year 2018 1. Introduction and theoretical background We are attending a revolution in the consumption of audiovisual contents. The incursion of YouTube has promoted the transition of a flow television model, where there is the attempt to catch audience’s attention and mantain it from one program to another, to a model of file television, where there is access to contents on demand (Konpare, 2002). But the phenomenon is not exclusive of YouTube. Cable television, contents services through streaming such as Netflix or the pay-per-view versions of conventional televisions are examples of file television close to us. Concurrently to these changes, new types of contents or new forms to publish them have emerged, like Netflix’s decision to release all the chapters of series they produce simultaneously. We can consider that the mediatic environment is submitted to a very strong evolutive pressure right now (Scholari, 2012; Scholari, 2013), and that probably this relatively new concept of file television will force changes on conventional media. In YouTube’s case, there have appeared content creators adapted to their particular characteristics: the so-called youtubers. These new communicators come from different professional backgrounds (or not so professional though), they produce audiovisual contents with a certain regularity and organize within their own celebrity system, which reflects values that often do not coincide with mass media (Burguess, Green, 2009: pos. 506). There is still few academic research about it because they are a relatively new phenomenon but YouTubers are an extremely interesting case of study due to reach some of them have achieved, such as the Swede YouTuber PewDiePie  which, with a community of almost 60 million followers around the world, with an income of more than 12 million dollars a year. 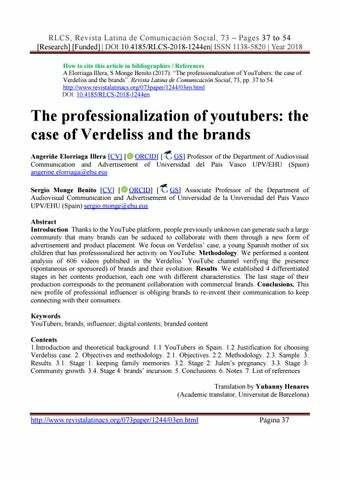 On the other side, it is not only about reach, but also about YouTubers phenomenon as opinion leaders and, therefore, their relevance as prescriptors (Ramos-Serrano, Herrero-Diz, 2016). 1.1 Youtubers in Spain Although the most successful YouTubers dedicate to that professionally, many of them still cultivate a certain amateur aesthetic and a confessional style in their contents. Video after video, these communicators have created their own personal brands and community of followers around them. The ten Spanish YouTubers with the largest number of followers have communities between 25 and 6 million followers, with thousands of millions of views of their production, as seen on Table 1 (we have excluded the accounts of Toys and Funny Kids Surprise Eggs and ExpCaseros because we considered they belonged to another genre) The sizes of these audiences start to compete with those of the producers of conventional contents such as televisions. Therefore, it is not strange that brands, besides creating their own contents for YouTube (Costa-Sánchez, 2017), they have started to get interested about these new celebrities and influencers of the platform. We must consider that YouTube does not allow monthly subscriptions to contents (like Twitch, for instance) or micropayments to access them (like Filmin), hence the only available business model for YouTubers is the one depending on advertisement (Izquierdo-Castillo, 2012). RLCS, Revista Latina de Comunicación Social, 73 – Pages 37 to 54 [Research] [Funded] | DOI:10.4185/RLCS-2018-1244en| ISSN 1138-5820 | Year 2018 greater presence in Verdeliss channel than in other digital influencers’ with more followers. And this makes it a more interesting study subject. Secondly, and even though her audience does not reach the top 10, the community that has gathered around her is considerable, keeping in mind that she was an anonymous person before she started releasing contents on the net. We are talking about 1.1 million followers only in her YouTube channel, more than 180.000 on Facebook and more than half million on Instagram. As reference, we can cite other channels of similar topic and that perhaps have been covered on traditional media, such as El Club de las Malas Madres  (2.693 followers) o Miriam Tirado  (9.650 followers). 2. Objectives and Methodology 2.1. Objectives The objectives of this research are the following: 1. 2. 3. 4. Describe the audiovisual production of the YouTuber Verdeliss. Identify different stages regarding genres used in videos. Analyze the presence of commercial brands in videos. Examine the evolution of said presence through the different stages. Regarding genres, videos show different types of contents that we have classified into the following categories that describe most of its production. It is important to keep in mind that some videos (a minority) respond to more than one of these genres and some do not respond to any of them at all: 1. Slice of life: the video shows the family doing quotidian or not so quotidian activities (a trip, an excursion). The characters are the members of her family and talk to the camera naturally (as they would do in the typical family video) but also perform actions belonging to the ongoing activity. This is one of the main genres of the channels and its presence increases progressively in time, as well as the duration of these kind of videos. We could classify it as a sort of reality TV that introduces us in the life of an idyllic family (of eight members in its last stage!) where there never seems to be quarrels or discussions. And, as Khan states (2017), the main driver of users to consume YouTube contents is mere entertainment without complications. 2. Baby’s development: these videos capture some special moment of the development of one of the sons or daughters of Verdeliss (their first steps, their first gurgling, their first words, their first bath …). On many occasions, it is the only content they show, but as Verdeliss channel evolves and videos get longer, this genre is combined with the previous one (“slice of life”). 3. Videocreations: the video combines pictures, video fragments and music in a creative manner. Almost all videos have a cover (some introductory seconds with some overprinted title) that belongs to this genre, but said cover has been omitted unless it is the exclusive content of the video. 4. Camera confessions: Verdeliss (and sometimes her husband, Aritz) talks directly to the camera for some minutes about a topic. The discourse is the main appeal of the video. For instance, she dedicated a series of videos to what she felt every week of her fourth pregnancy and part of the fifth one, but also uses that genre to talk to her subscribers about any other subject she considers (her thoughts about having a fifth child , the presence of brands in her channel  or the bad impression about how things rushed during her fourth birth ). Within this genre there are also a series of short videos (4-5 minutes) where week after week she showed the progress of her belly during the fourth pregnancy and part of the fifth one. 5. Tutorial: Verdeliss explains how to do something, either the recipe of the chocolate cake or to prepare the bag she will take to the hospital for postpartum stay. 6. Product review: A type of video focused on examining the qualities of a product or compares different products/ brands of the same category. It may be spontaneous; like several videos she did comparing different brands of cloth diapers or sponsored (like several product appearances). On the last stage of the production, sometimes it is shown inside another kind of video (usually slice of life). RLCS, Revista Latina de Comunicación Social, 73 – Pages 37 to 54 [Research] [Funded] | DOI:10.4185/RLCS-2018-1244en| ISSN 1138-5820 | Year 2018 though brands have always been present in Verdeliss contents, that percentage of videos with presence of brands has increased noticeably in the last stage of its production. Figure 1: Number of views per video in the 4 stages of production. Source: authors’ own creation. From this table, we can conclude that videos increase in duration from an average of four and a half minutes on the first stage until the 12-13 of the third and fourth stage. The views also increase as time passes, being the second stage remarkable due to its great standard deviation (more than a million and a half). Said deviation is due to the fact that stage 2 includes, as observed on Figure 1, some of the more viewed videos of the whole channel (such as the videos of Julen’s birth, with 14 million and 9 million views respectively). Probably the views of the first two stages are higher than they were when their contents were originally released thanks to the effect of new followers browsing old contents. RLCS, Revista Latina de Comunicación Social, 73 – Pages 37 to 54 [Research] [Funded] | DOI:10.4185/RLCS-2018-1244en| ISSN 1138-5820 | Year 2018 followers with the YouTuber in real life. The first two is held on Summer 2014. The first once was done in El Retiro park on 15/08/2014 and Verdeliss does not record anything because she feels overwhelmed by the event, so she limits herself to thank attendants in a video . The second one is done in a park in Barcelona on 07/09/2014 , and dozens of people attend bringing several gifts for the family. On minute 7:30 of that same video, Verdeliss states that on that moment they became aware of the number of people following and appreciating them. The third meeting occurs in a store in Madrid on Summer of 2015, more specifically on 16/08/2015 , and technically the video about her is framed within the fourth stage, when sponsored brands have already appeared on the channel. Hundreds of people attend to this meeting and lasts more than three hours. The line to wait for the turn to see them extends to sidewalks close by and many people cannot greet them because they cannot stay long. During this stage, Verdeliss keeps making videos more often, at the same time that she increases their duration. The dominant genre of this stage is the “slice of life” (62.1%) and, as Verdeliss confirms that it is the type of video most appealing for her followers, said genre gains more protagonism on the next stage. Also, there are some camera confessions (23.6%) and even videos that mix these two styles (“slice of life” and camera confessions), because their duration increases considerably on this stage (20-minute duration videos are frequent) and this makes they can have more confessional parts and others where the family activity is portrayed. Moreover, there is a certain presence of “Baby’s development” videos (15.4%). As a consequence of the dominance of videos belonging to the genre “slice of life”, the presence of brands in a spontaneous manner still occurs (in 21.3% of videos), but now with more visibility and exposure. This is the stage that probably catches the attention of commercial brands. Verdeliss has turned into a reference in her thematic field (maternity and raising), with hundreds of thousands of followers and a demonstrated capacity of physical convocation. Her recommendations in her experience area probably have a very strong effect on her followers. And this is very attractive for commercial brands that, as we will see, will hasten the change towards phase 4. 3.4. Stage 4: brands’ incursion We have considered that the video “Opinion about advertisement on YouTube + New Project ?? ?”  (13/8/15) starts the fourth stage, that is still ongoing and which we can define as the stage of the presence of sponsored brands (187 videos). As they declare in the same video, up until then they have only collaborated with two brands (Lays and the application Clue) and only in one of the occasions there was a previous economic agreement (Lays). As they say themselves in this video of confessional style, this is an inflection point where they think about collaborating with the brand Carrefour by performing a series of videos of themes related with the contents of their channel (back to school, children’s electronics). Behind Carrefour much more sponsored brands with come (Dry Nites, Mamichic, Kobold, Dodot, Pabloski, Mumablue, Mission Wraps, Global Humanitaria, Little Swimmers, Planeta de Agostini, Bebitus, Coca Cola, Bugaboo, Duracell, Rastreator, HP, Mercadona, Turismo Toledo, Lookiero, Booking, Fontvella, Samsonite...), which presence marks this fourth stage in YouTuber’s contents. RLCS, Revista Latina de Comunicación Social, 73 – Pages 37 to 54 [Research] [Funded] | DOI:10.4185/RLCS-2018-1244en| ISSN 1138-5820 | Year 2018  https://www.youtube.com/user/malasmadres  https://www.youtube.com/user/miriamtirado  https://www.youtube.com/watch?v=XYzzQtvslJs  https://www.youtube.com/watch?v=CBTjibsmFt0  https://www.youtube.com/watch?v=9_xWaa0EXRU  https://www.youtube.com/watch?v=N5L0_AKZMkw  https://www.youtube.com/watch?v=FcqfJkeMG0k  https://www.youtube.com/watch?v=roktJSemurc  Por ejemplo: https://www.youtube.com/watch?v=MZdp0x873QU, https://www.youtube.com/watch?v=9serS4DejGk, https://www.youtube.com/watch?v=AXjdHSAjJ_8  https://www.youtube.com/watch?v=TiKQOBuF0Gs, https://www.youtube.com/watch?v=oQmSXlOR4wY  https://www.youtube.com/watch?v=8NPtak5ijo4  https://www.youtube.com/watch?v=9ekoKn5IT9g&t=101s  https://www.youtube.com/watch?v=UeM1oRUFGDE&t=287s  https://www.youtube.com/watch?v=CBTjibsmFt0  https://influencerfuned.com/ 7. List of references Chang, S; Molesworth, M; Grigore, G. (2015). YouTube Beauty Brands and the Dynamic Processes of Prosumption. Proceedings of the 40th Annual Macromarketing Conference, 489. Disponible en: https://www.researchgate.net/profile/Clifford_Ii3/publication/284450339_Marketing_as_Provisionin g_Technology_Integrating_Perspectives_on_Solutions_for_Sustainability_Prosperity_and_Social_Ju stice_Proceedings_of_the_40th_Annual_Macromarketing_Conference/links/565374ac08aeafc2aabb 45a7/Marketing-as-Provisioning-Technology-Integrating-Perspectives-on-Solutions-forSustainability-Prosperity-and-Social-Justice-Proceedings-of-the-40th-Annual-MacromarketingConference.pdf#page=489 [Consultado 20/10/2017] Chau, C. (2010). YouTube as a participatory culture. New Directions for Youth Development. Volume 2010, Issue 128, 65–74. Costa-Sánchez, C. (2017). Estrategias de videomarketing online. Tipología por sectores de negocio. Communication & Society 30(1), 17-38. RLCS, Revista Latina de Comunicación Social, 73 – Pages 37 to 54 [Research] [Funded] | DOI:10.4185/RLCS-2018-1244en| ISSN 1138-5820 | Year 2018 Kompare D (2002). Flow to files: Conceiving 21st century media. In: Media in Transition 2 Conference, Cambridge, MA, 11 May 2002. Available at: http://cmsw.mit.edu/mit2/Abstracts/DerekKompare.pdf [Consultado 10/10/2017). Carlos A Scolari, CA; Fraticelli, D (2017). The case of the top Spanish YouTubers: Emerging media subjects and discourse practices in the new media ecology. Convergence: The International Journal of Research into New Media Technologies, 1–20. Burgess J and Green J (2009) YouTube: Online Video and Participatory Culture. Cambridge, MA: PolitePress (Kindle edition). Díaz, Luis (2017): Soy Marca: quiero trabajar con influencers. Editorial: Bresca Grzesiak, M (2017). How a Personal Brand that has been Creatively Established in Social Media Becomes a Passport to Traditional Media and Receiving Advertising Contracts. Proceedings of the 3rd World Congress on Electrical Engineering and Computer Systems and Science (EECSS'17). DOI: 10.11159/snsm17.107. Keightley, CJ (2015). An investigation on YouTube and Brand Partnerships. Thesis. Disponible en: http://iiespace.iie.ac.za/bitstream/handle/11622/92/Cara%20Keightley%20%281%29.pdf [Consultado 26/10/2017] Fred, S (2015). Examining Endorsement and Viewership Effects on the Source Credibility of YouTubers. Dissertation Tesis. Available at: http://scholarcommons.usf.edu/cgi/viewcontent.cgi?article=6883&context=etd [Consultado 19/10/2017] Izquierdo-Castillo, J (2012). Distribución online de contenidos audiovisuales: análisis de 3 modelos de negocio. El profesional de la información, v. 21, n. 4. ISSN: 1386-6710. Khan M. (2017). Social media engagement: What motivates user participation and consumption on YouTube? Computers in Human Behavior, vol. 66, 236. Ko, HC; Wu, WN (2017). Exploring the Determinants of Viewers’ Loyalty toward Beauty YouTubers: A Parasocial Interaction Perspective. Proceedings of 2017 International Conference on Education and Multimedia Technology, 81-86. DOI: https://doi.org/10.1145/3124116.3124130 Lobato, R (2016). The cultural logic of digital intermediaries: YouTube multichannel networks. Convergence: The International Journal of Research into New Media Technologies, Vol. 22(4), 348–360. Article received on 19 November 2017. Accepted on 11 January. Published on 17 January 2018.